In the final years of the British rule, the Congress became synonymous with the leadership and guidance of Mahatma Gandhi, who steered historic movements of the Indian freedom struggle. Rahul Gandhi was elected the president of the Congress earlier this month. New Delhi: The Congress has turned 133 years old today and the oldest party of India is at a crucial juncture, trying to remove the "corrupt" tag and transforming its image into a young and vibrant party under the leadership of newly-elected president Rahul Gandhi. On 133rd Congress Foundation Day today, party president Rahul Gandhi said that "the central idea of the Congress party is truth, we accept the truth, we work for the truth, we fight for the truth." The Indian National Congress (INC) was founded in 1885. Headed by British civil servant Allan Octavian Hume, members of the Theosophical Society - Dadabhai Naoroji, Surendranath Banerjee, MG Ranade, Womesh Chandra Bonnerjee, Dinshaw Wacha, Monomohun Ghose and William Wedderburn established the Indian National Congress. Womesh Chandra Bonnerjee was the first president of the Congress. The Indian National Congress was the sole representative of the people of the country during the pre-independence struggle and became the largest vehicle of the Indian National Movement. In the final years of the British rule, the Congress became synonymous with the leadership and guidance of Mahatma Gandhi, who steered historic movements of the Indian freedom struggle. Congress leader Jawaharlal Nehru, who was a front-runner in India's struggle for independence, became the first Prime Minister of independent India and held the position for 17 years. Indira Gandhi, Mr Nehru's daughter, became his political successor and the first woman Prime Minister of India, a position she held for 15 years before her assassination in 1984. The Election Symbol of the Congress party in 1885 was 'two bullocks with plough'. It was, however, changed to "right hand" symbol, with palm-side facing front by Indira Gandhi-led Congress in 1978. Indira Gandhi's son Rajiv Gandhi took over from her and became the youngest Prime Minister of India from 1984-89. In mid-1987, the Bofors scandal damaged his corruption-free image and resulted in a major defeat for his party in the 1989 election. He was assassinated in 1991 by a suicide bomber from the LTTE. Rajiv Gandhi was succeeded as party leader by PV Narasimha Rao who was elected prime minister in June 1991. He is often referred as the "father of Indian economic reforms". Sonia Gandhi, Rajiv Gandhi's widow, became the Congress president in 1998. In the 2004 general election, the Congress forged an alliance with several regional parties and formed the new government as the Congress-led United Progressive Alliance (UPA) and Manmohan Singh was appointed as the Prime Minister. Manmohan Singh's first five-year tenure as Prime Minister was marked by major initiatives like MNREGA and RTI. His second tenure, however, was tainted with major scams, prompting the opposition to allege that there was "unprecedented" corruption. In 2014 Lok Sabha elections, the party had lost much of its popular support and won only 44 seats. 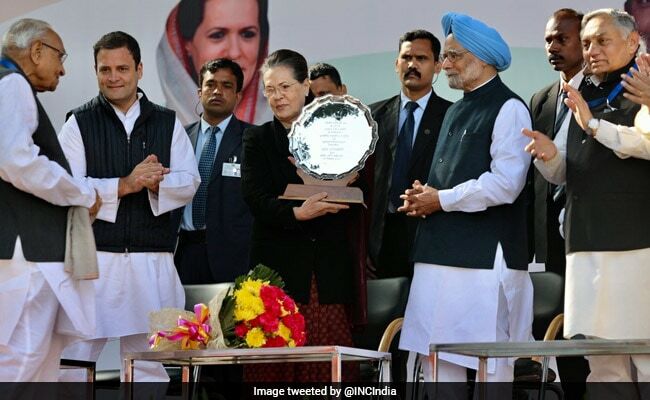 In December 2017, Rahul Gandhi was elected the President of the Congress, taking the party's reigns from his mother Sonia Gandhi who had helmed the country's oldest party for 19 long years.